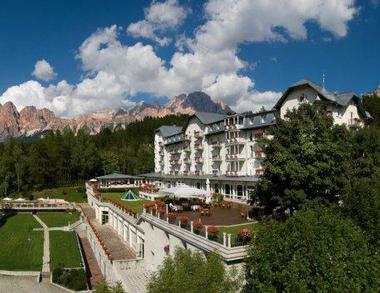 Hotel Cristallo has been the place of enchantment and charm since 1901, when it opened itself as a fine holiday destination to Dolomites' locals and tourists alike. The five-star hotel offers rest and recreation through a combination of luxurious amenities matched only by the elegance of its historical architecture and design. The hotel is home to a cutting edge spa as well as a top-class golf course, among other sophisticated amenities that await even the most discerning of guests, whether they're here for business or leisure. Aside from being the ideal location for business meetings and social events, Hotel Cristallo has also been the choice venue for all kinds of regular events like golf tournaments and music events. 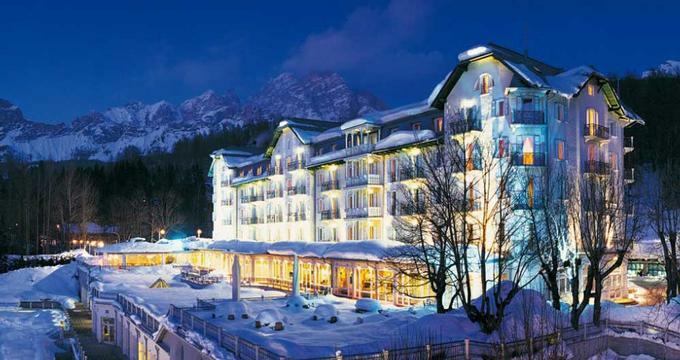 Cortina is more than just a skiing destination. This is where travellers will find the Regole Ampezzane, a famous property composed of all the forestry and grazing lands within the valley. These are ancestral lands, meaning that they belong to its earliest inhabitants and have been required by law to be preserved. All these efforts of preserving 16,000 hectares of ancestral lands have made an interesting cultural and historical symbol as well. These efforts have also resulted into the beauty surrounding Hotel Cristallo today. Furnished with care and elegant styles, each one of these well-appointed rooms is filled with luxurious amenities and breathtaking views, making them an ideal setting for making unforgettable moments. 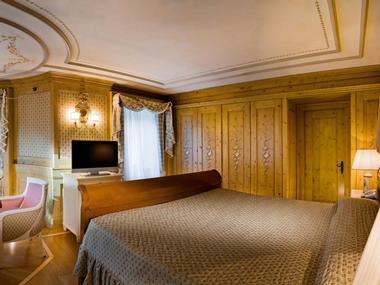 Hotel Cristallo offers a total of eight guest rooms and suites, starting with the Classic Room which offers standard but sophisticated amenities that promote the extreme comfort that a 5-star L service would be known for. The room is hand-decorated and provided with amenities by Transvital. Its bathroom is designed with Carrara marble and Spa, and comes with a shower. Some of these rooms can also be connected with Superior rooms for even more space. The Superior Rooms offer wider space and is the perfect solution for anyone who wants to stay at Hotel Cristallo with a place to relax after an entire day of going out and enjoying the attractions. Much like the classic counterpart, the superior room is also hand decorated and come with Transvital amenities. In addition, however, the room has a hallway and a living room with comfortable armchairs and sofas. The bedrooms have walk-in closets as well. As mentioned earlier, these rooms can be further expanded by connecting them to some of the classic rooms. Wide and bright are two words that describe the Junior Suite since they're designed for those looking for a holiday that's filled with romance and fairytale charms. There's a spot for a nice candlelight dinner for two, surrounded by a surreal atmosphere. 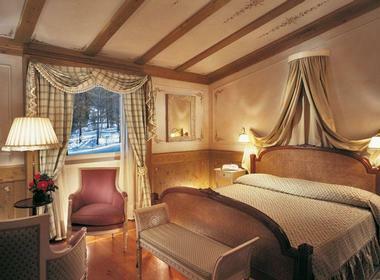 The rooms are also built in a way that guests are treated to a spectacular view of the Dolomites. The Suite is an even larger and more spacious version of its junior counterpart. In fact, these rooms have two LCD TVs for maximum entertainment. Meanwhile, there's still the comfort offered by the King sized bed as well as the space given by the hallway. These rooms also offer views of the park or the valley. Guests who take the suites also get VIP status upon checking in. Another thing to note is that the suite can be expanded by connecting it with any superior room. Executive Suites are designed with a dynamic and contemporary lifestyle in mind. It has a bedroom and a living room, both of which are filled with the same luxurious amenities as the other rooms. What makes this suite unique is the fact that it has two different entrances to allow more movement and focus depending on what the guests want. These rooms also have two LCD TVs for their entertainment and two bathrooms with a shower. Guests who take the executive suites also get VIP status on checking in. As the name suggests, the Family Room offers more space within a single accommodation to cater to an entire family who wants to relax and enjoy a vacation together. The room is designed to have a familiar home-like atmosphere by connecting two different spaces while still providing space for every member. Family rooms are either classic or deluxe, which are rooms that are either composed of a classic and superior room or a superior and a suite, respectively. Each of the bedrooms in the Family Rooms have a king sized bed or two twin beds. There's also an option of adding an extra bed as well as getting some baby equipment upon request. For big spaces with lots of historical design, the Royal Suite is the right choice. This is actually the accommodation of choice for many special guests such as government officials and celebrities. 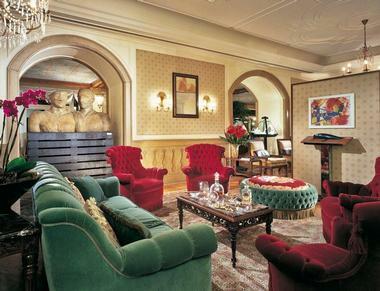 Guests of the Royal Suite get special VIP status, including fruit and sparkling wine and a welcome card. Of course, these rooms get only the best of the hotel's features for a comfortable and productive stay. There's wireless internet access, LCD TV, and amazing views of the park or the valley. Some of the royal suites have a refined balcony as well. Finally, the Presidential Suite is the biggest and most luxurious of all the accommodations. Spanning up to 180 sq. m. in area, this room has enough space to fit a Jacuzzi, a private Hammam with Cromotherapy, and more. This room has also been the accommodations for people like Peter Sellers, Tina Turner, and Frank Sinatra, who have all been enchanted by the glamour and luxury of the exclusive furniture, unique Tofane view, and all the other features of this accommodation. While Hotel Cristallo might have four restaurants, they all share the same principle: quality dining experience for all guests. There are four different styles with even more different settings to cater to all kinds of guests. Starting off with breakfast, Cristallo serves its guests with more than enough nourishment to help them get started with their day, offering premium coffee and tea alongside their choice of fresh bread, fruits, or other breakfast choices. The Gazebooffers high quality fresh seafood dishes in a sophisticated gourmet environment. The delicious seafood cuisine is thanks to the hotel's executive chefs who use only the freshest locally available ingredients to make the meals they serve the guests. These meals are then paired with the best of Italian and foreign wines. All this is experienced while being surrounded by a crystal-clear glass enclosure that gives a panoramic view of the Tofane Mountains. Another great place for dining with an amazing view is the Cristallo Veranda where Italian cuisine is served with the right wine pairings. Being right in the heart of the Dolomite, there's no doubt that guests will have something breathtaking to look at when they gaze outside the window. With fine wooden furniture and a charming picturesque setting, the Cantuccio is an intimate venue for dinners and sampling wines especially prepared by the executive chef. Here, sparkling glassware and prestigious bottles is the centre of focus, and the satisfaction of connoisseurs is the goal. Finally, the Terrazza is the place of dining with magnificent views like no other. This outdoor restaurant offers breathtaking views with no restrictions while guests enjoy the best dishes that the hotel can offer. This is ideal for those who want to enjoy their meals while being surrounded by no less than Mother Nature herself. There are actually more ways to enjoy dining at Hotel Cristallo, such as the Meeting Point Hotel Bar and the La Stube 1872. Whatever may be the guest's choice, no doubt each one will be a different dining experience. Kids will have their own place to be themselves at the Hotel Cristallo with the help of the Kids Club. There, they will be able to make new friends and have fun with them through various indoor and outdoor activities that are available all day. Indoors, children will have all kinds of games to play that are not only fun, but will help them learn and teach them to play with their new friends. Outdoors, there's a playground for both the summer and winter seasons, with ski instructors during the latter. Either way, the kids club ensures that the children of guests are given the same five-star attention as the grownups.